At the top of Mr. Trump’s friendly authoritarians have been some of the globe’s most brutal dictators: Kim Jong-un of North Korea; Vladimir V. Putin of Russia; Xi Jinping of China; Abdel Fattah el-Sisi of Egypt; Recep Tayyip Erdogan of Turkey; and Rodrigo Duterte of the Philippines. Mr. Bolsonaro is the latest to be added to the list. A former army captain who served for decades in the Brazilian congress, Mr. Bolsonaro vaulted onto the international scene by winning his country’s elections last year. He made his first international appearance as president when he attended the World Economic Forum in Davos, Switzerland, last month. 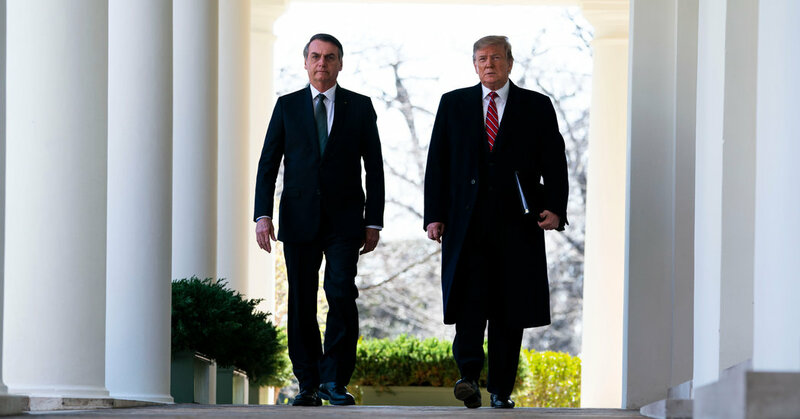 American officials said that they expected Mr. Trump and Mr. Bolsonaro to discuss the future of Venezuela during discussions at the White House. A senior administration official, who declined to be identified, told reporters that the United States appreciates Brazil’s provision of humanitarian aid to Venezuela and its support for Interim President Juan Guaidó. Citroën boss: ‘Where does my handbag go’?